Random Handprints - A NYC Mom Blog... live from New Jersey: Jersey-fication Complete! Today I am making my transformation to Jersey Mom official. The (now defunct) NYC Moms Blog button is coming down, and my Jersey Moms Blog button is going up for all to see this middle-aged mom is now a Jersey girl. 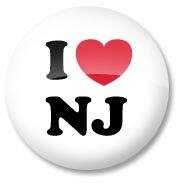 You can read how much I Heart NJ here. If you're a reader with love for NJ, tell me what the best things are about my new home state.